Around 70% of the time only protrusion and cut are used in CAD drawing. If you look at a 3D CAD model of any system of a car, you will see that most of the drawing starts with protrusion. Probably you can create a protrusion even blindly in any application, but the challenge is to create it in some desired position. We will discuss here how to create a protrusion in Solid Edge. Solid Edge is a completely icon-based 3D CAD package. You need to click the protrusion icon first. See the snap below. (Hover mouse to read the label or click to enlarge). I. Profile step options: You can select an option of either drawing a sketch or using a previously created sketch here. II. Drawing a profile: Here you will be selecting an option for either drawing a profile on plane or editing the base sketch of an existing drawing. 2. Side step: This step decides on which side of the sketching plane/surface the protrusion will be created. While creating a protrusion, side is selected by mouse click. I. Through all: Extend the protrusion through all the faces of the body. II. Through next: The sketch is extruded up to the next intersection surface at the selected direction. III. From/To extent: The sketch is extruded from a selected face up to a selected face. IV. Finite extent: Here you have to specify depth of the protrusion. For every steps/sub-step there will be instructions displayed just below the SmartStep ribbon. Protrusion is the basic and most used feature of Solid Edge as well as most of the other 3D CAD packages. 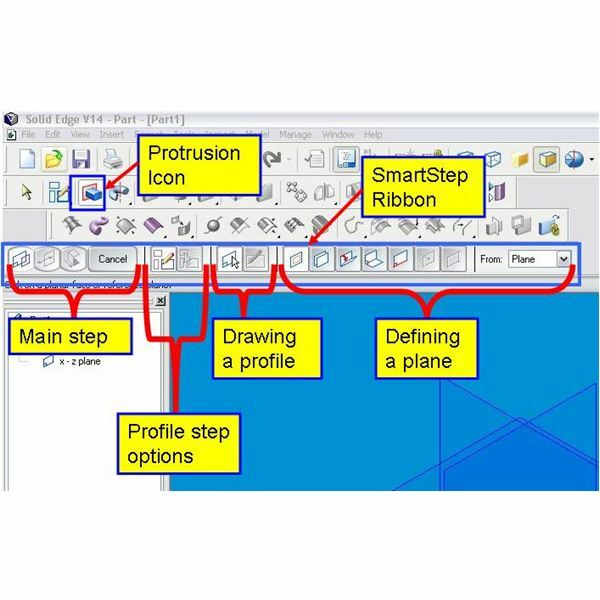 The SmartStep ribbon and instructions guide the user through the protrusion creation process in Solid Edge.